Hopefully most of you noticed last week that we debuted our New Player Commander Decks! 10 decks, a great price for each one, and you’re playing Commander. Here on Cool Stuff Inc, each of the commander writers got a chance to show off two of the decks, putting our own spin on them. Make sure to check those out, as there are a ton of great ideas. As I thought about this week’s article, though, I focused on the idea of Convertible Commander. Normally, we take a fully-built commander deck and build an optionboard, which is a small number of cards intended to replace an equal number of cards already in the deck and give us a new experience. The thought is we can save money and space by keeping two full decks in one normal-sized deckbox. But why must we limit ourselves to just that? Convertible Commander can be anything transformative. Back when Tiny Leaders was still a thing, we did a deck that transformed from TL to EDH. Before Convertible Commander we built a deck that was 150 cards where you randomly removed 50 before starting. No one liked it (oh well), but it was different. So why not do something a little different this week? Last week, we looked at the New Player Commander Decks for Boros ( ) and Orzhov ( ). Tell you what? Let’s smash them together. 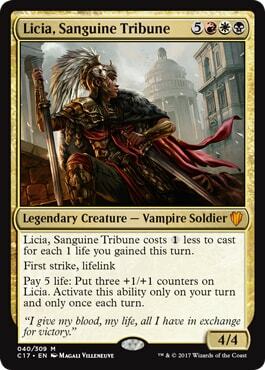 Only one rule: just one new card -because we need a Mardu ( ) Commander! This is an interesting exercise. We’ve got a very limited pool of cards, which means we have to be extremely careful with card selection. Several times during the process I thought “oh, I’ll just drop in a Pacifism” or some other thing where I’d choose a card that makes perfect sense, and would remember that I didn’t have access to that card. Here, we have to think of alternative ways to achieve our goals. These decks are built with nice themes already, which means we can start with those themes. 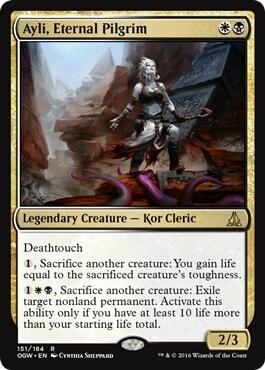 The Boros deck has a life gain theme, and that’s something the Orzhov do automatically sometimes, so we can play into lifegain. And when we look at Licia, she wants us to be gaining life (so she gets much cheaper) and she gives us a way to use that life so we’re not just hording it like so much gold. It may not be the world’s most powerful way to leverage those effects, but we’re not going to build the world’s most powerful deck with this pile of cards anyway, so we’ll do what we can. Before we dig into the cards, let’s talk about beginning deck-building (or intentionally self-limiting to keep one’s deck-building creative and fresh). Often beginners build decks with the cards they have. If you’ve played three drafts, bought one of these decks, and have a small box of cards a friend gave you because they don’t play anymore, you might be working with 800 cards. Someone invites you to Commander night, and you want to build a deck. You’re not going to order a bunch of cards (well, maybe you are, but for this example, you’re not). You’re going to look through your pile, find a Legendary creature, and find enough cards in those colors to make a deck. So the key is to look for some kind of consistency. We want the deck to do something, and do it with some amount of regularity, so we have a plan we can execute. In this case, we want to have ways to gain life so we can knock down Licia’s casting cost and get her out quickly, then use that life to pump her up and turn her into a scary threat. But what if you opened a Zegana, Utopian Speaker in your last draft, and you like her? She cares about +1/+1 counters, so you probably want to run everything you can that puts +1/+1 counters on things. Every card with Adapt, of course, goes right in. Biogenic Upgrade and Stony Strength, too. And in that box of cast outs there’s a Clockwork Beetle and a Clockwork Condor! Then we look for things that work with those counters, so we slide Titanic Brawl in. And we probably want Essence Capture. Maybe we play into the counters thing and run other cards we have that use counters, even if they’re not +1/+1. That gives us space to grow into cards with Proliferate and other counters-matters cards eventually. After a year, it’s probably a completely different deck under Vorel of the Hull Clade, but the initial focus gave us direction. So as you’re looking to build new decks, no matter your limitation but especially if you’re a beginner, focus on the theme. It’s often true that a smaller creature with an ability that works with your theme is better than some huge vanilla beater. If your commander wants you to draw cards, Mulldrifter is probably better than Tidal Kraken. To get back to our Licia deck, we kept nearly everything that gains us life. We really want to gain about three life on turn five so we can play her that turn, which is going to be tough, but the potential exists. We can play Ayli, Eternal Pilgrim on turn two, then a Basilica Bell-Haunt on turn four (maybe we play Boros Locket on three), and on turn five we sacrifice our Bell-Haunt to Ayli, gain four, and play our commander. Life gain doesn’t win us the game, though, so we’re still going to have to win by attacking with creatures. We prioritized the creatures with evasion and kept some of the effects which pump our creatures to punch through damage. We can also hope our commander gets big enough she’s a serious threat. 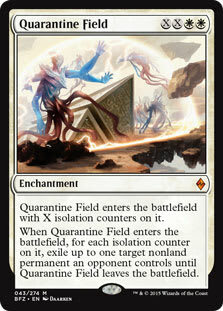 With enough mana we might be able to Quarantine Field away someone’s board to where she can get through. Triumph of Gerrard could get her through, too. The Orzhov deck brought a sacrifice theme to the party, as well as a good bit of solid removal and card draw. So we’re leaning into that. We’ve got a bunch of creatures, and we can afford to lose some of them for value. We are, however, going to need to remove some threats in order to stay alive, so Murder and Angelic Purge are welcome additions. There are a couple of fun cards in there like Hidden Stockpile, but for the most part, we’ve taken two decks and mashed them together, using the cards from each to focus the final pile. We gain life most of all. We kill stuff and attack with our creatures. Then we sacrifice those creatures for value. If I were going to add anything to this deck, I’d look at Felidar Sovereign as an alternate win condition. We’re also in the colors of Wrath of God effects and Reanimate effects, so it might be worth it to add in a couple ways to buy back our best stuff and ways to wreck the entire board if things get out of hand. Finally, I think I’d want to speed it up: I’d look for cards that do the same thing for cheaper or at a faster speed. Contract Killing is a great example. We don’t really care about the Treasure tokens, so it’s probably not worth it to run a five-mana sorcery-speed kill spell when we can run Hero's Downfall in its place. All that said, though, the first place I would actually start is the mana. I’d get more lands that tap for multiple colors. I’d start with Nomad Outpost and a few more comes-into-play-tapped dual lands, especially ones that tap for . As I increased my collection, I’d start looking at stronger duals and fetches. The reason I’d start here is two-fold: while optimized mana is rarely necessary for Commander, terrible mana will mean you can’t really play, so getting it somewhat better will make a huge difference in how this deck plays. Additionally, lands keep their value in a collection. They may not have amazing resale if they’re uncommon or common duals, but they can always be used in the next deck that plays those colors, as opposed to some specialty creature that is specific to this one deck’s theme. I’m curious. If you were going to smash two of these decks together, which ones would you choose? Only new card you can add is the commander. Please let us know in the comments! In the meantime, enjoy your three decks for the price of two. Heck, tag in last week’s optionboards and you’ve got five decks!